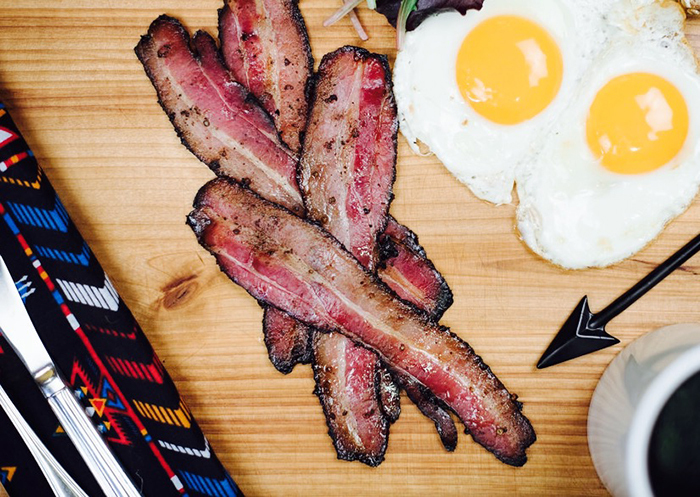 Debuting at Vancouver Farmers Markets this past May, Heat Laliberte of One Arrow Meats sells his artisanal, naturally-smoked bacon twice monthly at Mt. Pleasant Farmers Market. 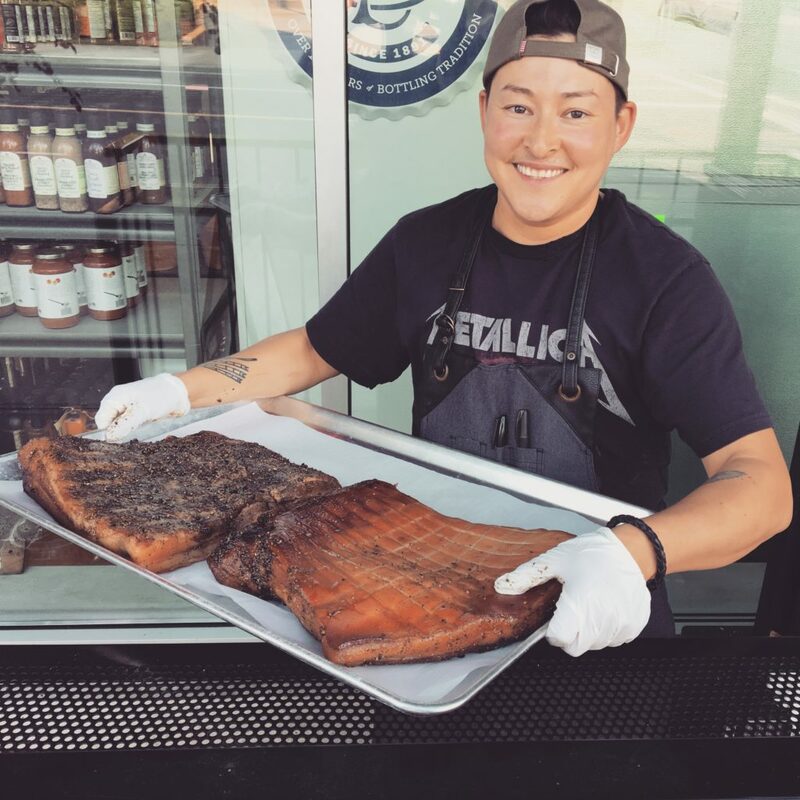 Besides producing some seriously tasty bacon, Heat works as a chef at the Fairmont Pacific Rim Hotel and feeds athletes at the Olympics in his spare time. He also mentors kids at the Urban Native Youth Association and supports Good Food For All’s Punch n’ Munch Program at the Eastside Boxing Club. We recently had the opportunity to talk with Heat about how he got started in the world of smoked meat, and his involvement in various projects in Vancouver’s DTES. Q: What inspired you to start smoking your own bacon? A: I’ve been cooking in the restaurant and hotel industry since 2005 and of all the places I’ve worked learning charcuterie at the Fairmont Pacific Rim has made me the most inspired and excited. In November 2016 I enrolled in the Aboriginal Youth Entrepreneur Program and learned the steps to start my own business. I graduated the program in January and won the Best Presentation/Business Idea in my class so that gave me the confidence to apply for the Vancouver Farmers Market. 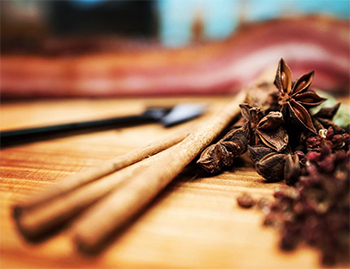 Chinese 5 Spice Bacon includes cinnamon, star anise, clove, Szechuan peppercorns, and fennel seeds. Q: Can you tell us a bit about the process? A: Currently I make my bacon at Pete’s Meat Butcher Shop on Arbutus and 12th avenue in Kitsilano. Pete only uses top quality product so naturally I went with using Johnston’s Farms Pork. What I love about Johnston’s is they source their pork from 15 farms in the Fraser Valley so we are supporting local farmers! I use a dry cure rub for my Bacon and cure for 5 days. I smoke my bacon naturally for 2 hours. I use Hickory wood for my Maple Bacon, Applewood for my Black Pepper and Honey and Alder wood for my Chinese Five Spice. For the Hickory Maple Bacon, I exclusively use maple syrup from Maples Sugar Shack in Squamish. 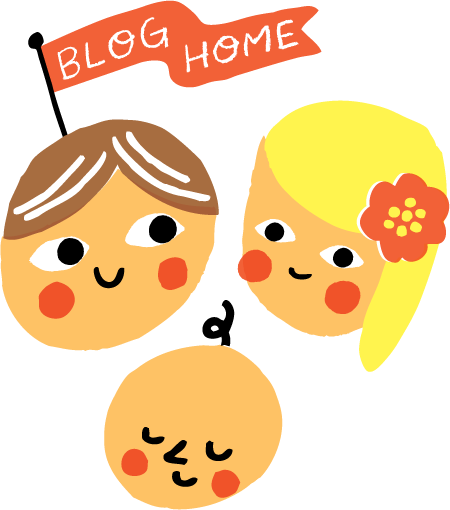 Q: You mentioned that you’re involved with some community projects in the DTES – tell us about the work you’re doing in that neighbourhood. A: I’m involved with an amazing organization called “Good Food for All” (www.goodfoodforall.org) started by Elizabeth Fisher. Ten percent of my market sales this Summer will go to the “Punch ‘n’ Munch” Program at Eastside Boxing Club. 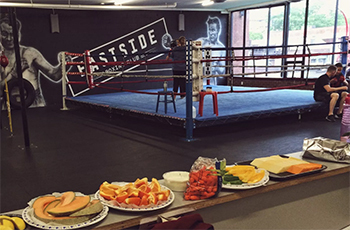 This program works to combat food insecurity and teach nutrition education to East Vancouver youth between the ages 13-19 that attend the Eastside Boxing Club after school training program. It’s so important to support and encourage youth to make healthy choices and positive life choices. I lost my brother to violence when he was only 19 years old so this program is close to my heart and I support and encourage others to 110%. I also am involved in Urban Native Youth Association mentorship program and will be doing a Q & A, cooking demo with UNYA youth in September 2017. Q: Do you have plans to expand your line to other types of cured meat and charcuterie? A: I love making sausages so hopefully in the future I can offer these to everyone! (maybe Christmas?!) I’m also up for teaching people if they want to learn! Q: What role do you see farmers markets playing in your business? A: I see the farmers market as a way to build a long standing relationship with customers and other vendors. It’s grassroots, it’s honest, it’s a foundation to build your customer base on. I’m meeting people that are coming back every other week and it puts the biggest smile on my face. You are sharing something you made by hand and put your heart into. When someone says thank you and that they enjoyed it with their family it just makes my day. When someone sees your passion for your product and how excited you are to share it with them I believe they want to be a part of that journey. People go to the farmers market to get ethical and quality product but also to make a genuine connection to who they buy from. Q: Can you share a bacon-inspired recipe with us? A: I make a awesome breakfast sandwich with a freshly baked ciabatta bun, sriracha aioli, Sole foods greens, sliced hoeweling’s tomato, sunny side up free run egg, gruyere cheese and my One Arrow Black Pepper & Honey bacon! Yum! 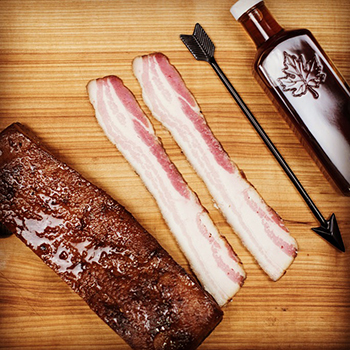 Get some of that tasty One Arrow bacon from Heat at Mount Pleasant Farmers Market this Sunday, July 30, and also on the following dates: August 13 & 27, September 10 & 24, and October 8. More details at the onearrowmeats.com. Make a donation to Good Food For All’s Punch ‘n Munch Program at this link.